Lot 284. Indo-Scythian Kingdom. Azes. Ca. 58-12 B.C. AR tetradrachm (23 mm, 9.58 g, 1 h). 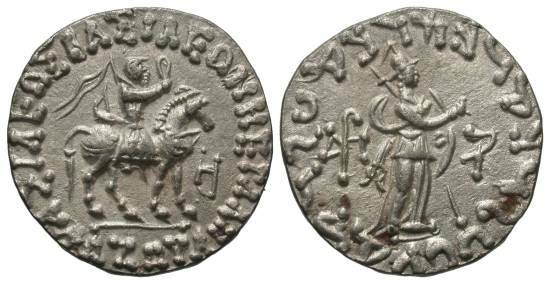 ΒAΣIΛEΩΣ BAΣIΛEΩN MEΓAΛOY AZOY, Azes seated right on horseback, holding whip and spear; in right field, letter / Athena standing right, holding spear and shield; in fields, controls. Senior 95.22T. Extremely fine.